Several recent studio projects are ongoing and I work on them simultaneously. Drawing with gunpowder and graphite, gouache, blood, embroidery and cut paper my two dimensional work chronicles our contemporary post 9/11 world. Shadow War, encompasses the totality of my artistic practice, bridging new materials and techniques together with the forms of previous work. Composed of over 400 unique pieces, this project is an attempt to mark events through accumulation. In this instance, the number of images corresponds to the approximate number of American airstrikes that have occurred in Pakistan since the United States began its clandestine drone program there in 2004. Each work is an original composition: the silhouettes of planes and drones appear in varying configurations, along with abstract markings that evolve from a variety of sources including the guides and targets of a control screen. These mixed media pieces consist of painted, collaged or drawn elements grounded on monoprints depicting satellite views of locations in the Middle East & South Asia. Newer monoprint projects expand upon the visual vocabulary of Shadow War. One series, Forced to Flee, is inspired by a woman’s escape from Syria and her ongoing effort to find a safe home for herself and her family. 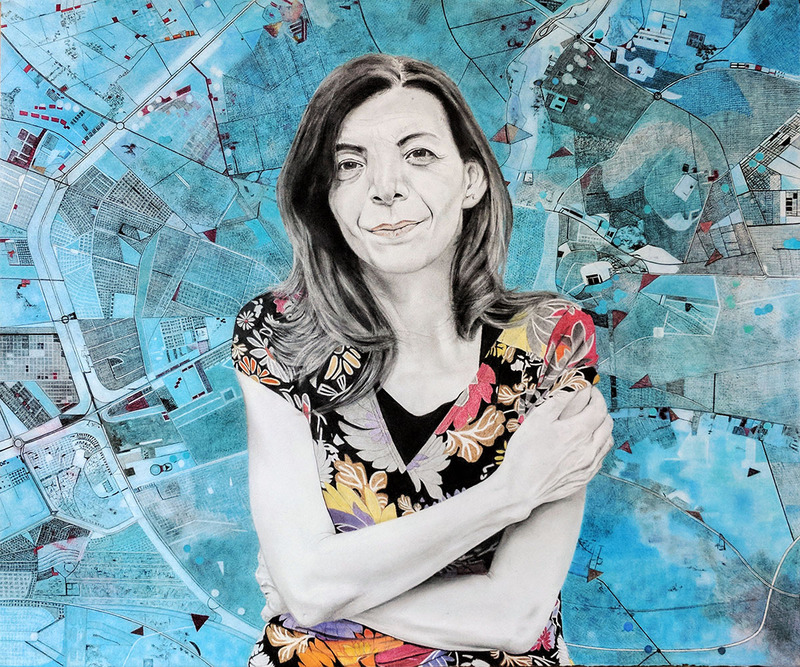 My personal connection with Lina has humanized the abstraction of this crisis and, from her stories, I hope to communicate her struggle, courage and tenacity with my work. A related series, Dangerous Threat, 2017 responds to the current American president’s words about immigration, Syrian refugees and border protection. Layered on black & white monoprints of billowing smoke, hand stamped letters cover the surface with repeated words – danger, security, extreme. The density of the layered words mirrors the confusion and complexity of the threatening language being used. In recent years I have also been expanding my studio work into three dimensions. Another continuing project, One to One, consists of a series of 7’ x 4’ x 6’ built structures. Fragile, delicate yet stable, these skeletal wood constructions refer to the framework for progress that women’s education can provide. Each small interior allows for intimate experiences with the content, encouraging inspiration within confinement. The wooden armatures are embellished with a variety of elements that I have made. Included are woven floor mats made of folded pages from the NY Times; hanging banners comprised of 8“x 10” drawstring bags beaded and sewn by women in literacy programs in Afghanistan; slate veiled with chalk and video projections and Tyvek panels overlaid with embroidered drawing and prints made from writings and drawings I have received from women in Afghanistan.